I have been racking my brain, trying to come up with a scenario where I actually need this carrier — it’s that cool. It’s a backpack, carrying both your laptop and your small dog — once you get to your destination, the included Pet Dome, stowed next to your laptop, folds out into a small enclosed crate, complete with a padded floor. PetEgo makes Chloe’s beloved messenger bag, so I know that it’s a good-quality product. 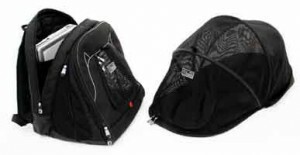 Toy breeds will fit best in the backpack, especially in the compact and standard (shown on the left side of the picture) configurations, but it has a third, fully expanded configuration that even Chloe can fit in. It comes in black and tan. I LOVE your site! My husband and I are planning a trip to Paris next month and we’re so relieved we found your site. I have a question about carriers, however, and would like your input on this PetEgo Pet At Work bag. It’s an awesome bag that would work for my husband who’s attached to his laptop as much as our dog is attached to him. Do you think it would be debatable that bag would fit under our seats in-cabin? Hi, Christie! We will have to swap tips and info as we each get ready to go. How big is your dog? If she’s tiny, I think this would be a good carrier to consider. It’s not what I’d normally think of as an in-cabin carrier, but it has ventilation, and I’d be surprised if the laptop portion (that would be on the bottom when you put the carrier under your seat) wasn’t padded. I don’t know if that area is also moisture-resistant (an official airline requirement). Like I say, your pup would have to be tiny, because she’d need to be completely under the seat for takeoff and landing, and assuming the laptop portion is, say, 2-2.5″ tall, that leaves, realistically, only about 8″ of headroom for your dog to fit in. The part that I think is so brilliant is the Pet Dome — once you’re underway, I don’t see any reason why you two couldn’t open the Pet Dome in your leg-room area, giving your dog a really large, enclosed area to relax in. I’m in France right now! I bought this bag for the trip and not a single problem with transporting our 15lb baby. We carried her in the bag and once on the plane moved her over to the dome. She was extremely comfortable. The only problem was United’s cramped leg room, but everything fit and they were extremely nice. The domestic flight didn’t allow our dog to sit on our lap. But the leg out to France from Dulles, they allowed her to sleep on our lap all the way. Our year-old dog was not given any medication. She slept the whole way through. Took her 2 days to recover from jet lag. But she’s great now! Fantastic, Christie!!! I loved the idea of moving her into the Pet Dome, and I’m thrilled to learn that it works in practice. I’m also pleased (though a bit surprised) to learn that the flight attendants allowed you to put her in your lap during the Dulles-to-Paris leg — they’re not supposed to, but how very kind that they bent the rules for you! Congratulations — sounds like I need to write a quick post suggesting this approach to people. I’m curious — with the laptop in place, I expected there would be only a tiny bit (8 inches or so) of headroom for your dog in the under-seat space. A 15-lb. dog needs more than that to be comfortable, even if you’re only planning to have her under the seat for takeoff and landing. Was there more headroom than I expected? How did your pup fit?